Building on the success of Beijing Design Week back in October, eleven of China’s most interesting and heterogeneous contemporary designers are exhibiting their work at Chinese Design Today here in London. In recent years, China has worked hard to define its role within the global design world. Mixing political and commercial interests, design has been culturally elevated within China, signifying an increase in the number of academic courses available to nurture new talent. Alongside this, there’s been an increased investment in design exhibitions, festivals and events resulting in more design students than any other country in the world. To explore the new tastes of oriental design, a new exhibition entitledChinese Design Today opened last week at Themes and Variations curated by the gallerist Liliane Fawcett. On show are an interesting selection of pieces from the new generation of young designers such as Zhang Zhoujie and Li Jia. The objects create a stimulating mix of voices with strong relationships with Chinese culture and a scathing vision of occidental stereotypes. Clear examples are the creations by Li Lihong, who analyses globalization during the 21st Century through porcelain logos of American commercial icons, decorated with traditional Chinese ceramic motifs, as seen in China – Apple and China – Mickey Mouse. A symbol of the growing colonisation of shiny western icons, the most ironic piece is China – McDonalds, just one of many pieces elaborated from the same logo. In a similar vein are the works of Shao Fan a painter, sculptor and designer who interprets the collision between the two worlds through his collection of “deconstructive” chairs. 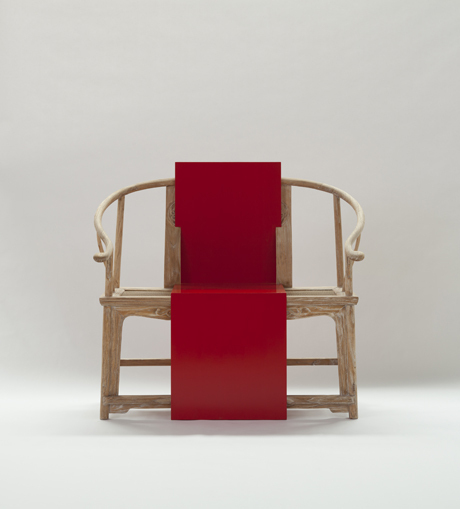 Fan composed the chairs using parts from traditional Ming furniture and contemporary pieces, highlighted in the piece King chair, that with its contrast of colours and textures, plays with Shao’s role of conceptual artist, conserving functionality as a piece of furniture. The gallery houses the work of the young designer Li Naihan. She studied design and architecture in London’s Bartlett School and collaborated in Beijing with the controversial artist Ai Weiwei. Her piece The Crates was considered one of the most interesting proposals during the Beijing Design Week 2011. On show here, Dressing table, perfectly reassumes the spirit of her work. Her research wants to express the chaotic and continual sense of movement in the daily life in Beijing and the necessity of mobile pop-up furniture that follows our globetrotting lives. The exhibition hosts a smart selection of objects with a strong international influence, where globalization becomes a suggestion to research new languages with solid roots into the past and high aspirations towards the future.